After almost a week commuters had hellish experience plying the Apapa-Oshodi expressway, respite finally came yesterday following the clearing of articulated vehicles from a section of the highway, which allowed some smooth ride to Mile 2. Speaking with reporters after inspecting the progress of the operation in company of heads of security agencies and other stakeholders, Commissioner for Transportation, Mr. Ladi Lawanson, said it was gratifying to report that the task force was able to free the road from Toyota to Mile 2 in a rigorous operation, which lasted 72 hours between Friday and Sunday. Giving details on the operation, the Commissioner for Information and Strategy, Mr. Kehinde Bamigbetan, said over 2,000 articulated vehicles were removed from the road including Oshodi-Apapa Expressway, Funsho Williams Avenue and Mile 2-Orile Road and taken to seven designated holding bays. Following public outcry, the state government last Thursday had to sympathise with residents aside setting up a task force to send the tankers and trucks off the road. The task force commenced work on Friday but its impact was not felt until yesterday when motorists could drive to Mile 2 without being hassled by articulated vehicles blocking the road. Although, when our reporter went through the route, trucks and tankers were still parked on the highway, the task force, however, ensured that articulated vehicles only occupied either the fast lane or the service lane, not both as it used to be. 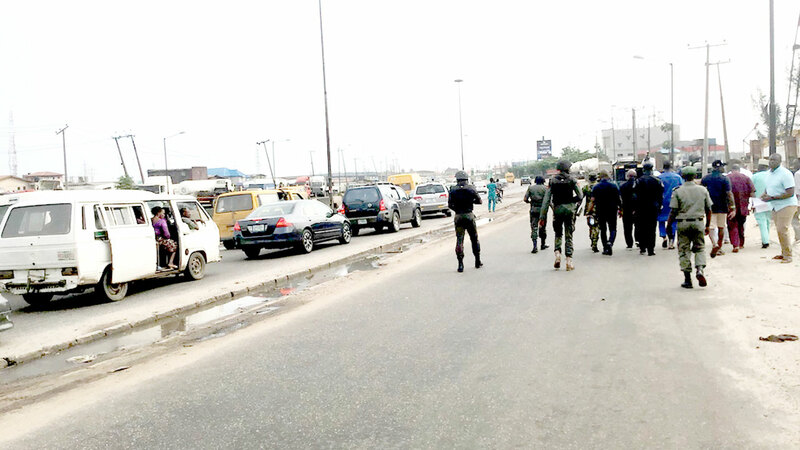 It was also noticed that members of various security agencies including paramilitary organisations were strategically positioned at different junctions cleared on the Apapa-Oshodi expressway to curtail a likely recalcitrant act by any of the tanker drivers. Before now, to get to Mile 2 using the expressway was impossible, especially last week, except by driving against traffic. The other alternative to Mile 2 was going through the Ago-Okota road. Chidinma Onyekwe said last week was really tough as she spent longer hours on the road aside having to pay more. She was, however, happy that the road has been cleared even though it is partial. Onyekwe appealed to the government to ensure that the tanker drivers do not return to their vomit by returning to the sections of the road that had been cleared. Sequel to the activities of the petroleum tankers and haulage trucks drivers, along the Funsho Williams Avenue and Oshodi/Apapa Expressway and other major roads in Lagos, which have continued to cause a perennial gridlock on the affected roads and constitute embarrassment to the state, the Lagos State police command at the weekend embarked on multi-agency operation tagged ‘Operation Restore Sanity on Lagos Roads’ to check the tide. The command in conjunction with other security agencies had embarked on series of consultations with the stakeholders in order to find a lasting solution to the problem and its attendant consequences on the law-abiding citizens plying the routes. Shedding light into the operation that has reduced the traffic gridlock to an appreciable level on those routes, Lagos State police boss, Imohimi Edgal, noted that the service lane was now free for smaller vehicles following a partnership with Planet Projects construction company, which aided the police in blocking the truck drivers from plying the service lanes. According to Edgal: “On Wednesday, July 18, a meeting was held with the heads of the Nigerian Army (NA), Nigerian Navy (NN), Nigeria Air Force (NAF), FRSC, NSCDC, LASTMA, and LASEMA in the state, to appraise the worsening traffic gridlock in the affected roads, which are to serve as alternative routes, during the closure of the Third Mainland Bridge for repairs and to strategize on the containment measures to be adopted, to curtail the menace of the recalcitrant tankers and trucks drivers. This was followed by an on-the-spot visit to the locations to assess the situation and identify both private/government unoccupied Holding Bays where the articulated vehicles blocking the expressway could be temporarily relocated,” he said. Sapid along Apapa-Oshodi expressway are also holding some containers; MRS loading bay, at Toyota bus-stop is also holding some petroleum tankers, while Capital Oil truck holding bay at Second Rainbow, Ijesha is also holding some petroleum tankers. The vacant parking lot opposite second gate in Tin Can Island is also holding some containers. To ensure that all stakeholders in the nation’s seaports and Lagos State government were carried along in the exercise, an expanded meeting was held on Friday at the Lagos State police command headquarters. After the meeting, security agents were deployed to tackle the menace. Amongst those deployed were 1,000 policemen, 150 personnel of the army, 100 naval personnel, 100 air force personnel, 100 officers of the NSCDC and 120 operatives of the FRSC. Others are 500 officials of LASTMA, 20 officials of LASEMA, 46 members of Amalgamation of Containers Truck Drivers, 50 members of Nigeria Association of Road Transport Owners (NARTO), 50 personnel of NUPENG and 35 members of Road Transport Employers Association of Nigeria (RTEAN). Owing to the concern of the Federal Government to end the lingering crisis, the Vice President, Prof. Yemi Osinbajo, accompanied by the Minister of Transportation, Rotimi Amaechi visited Lagos on Friday. They delegation was conducted round the Apapa-Oshodi Expressway by chopper for the assessment of the menace of the drivers along the axis. Also, the Commissioner of Police used the occasion, to brief the Vice President on the efforts being made by the command and other stakeholders to resolve the problem. At the end of the visit, the Vice President directed the police boss to clear the gridlock within 72 hours. On Saturday, personnel for the operations were deployed to the locations for the evacuation of the over 20,000 petroleum tankers and flat belt trucks causing gridlock from the service lanes and expressway to the six holding bays at Ijora, Isolo, Amuwo Odofin, Orile and Apapa. Edgal said: “However, it is pertinent to inform the public that lack of equipment, particularly heavy towing vans to lift the containers at the bays and tow some of the grounded vehicles away from the road has slowed down the operation. Other noticeable constraints are non-cooperative attitude of some of the drivers, who thought government might use the opportunity to impound their vehicles, despite assurance from their union leaders and other stakeholders, and lack of cooperation by facility owners/operators who complained of late notification. “Nonetheless, it is gratifying to note that the Lagos State Government has signified intention to engage the facility owners/operators to enable them reach a common ground to resolve the matter. In the same vein, the command in conjunction with the union leaders will continue to engage the cynical drivers to key into the operation in the interest of the public. Meanwhile, the exercise has been extended by 48 hours,” he added. Meanwhile, the leadership of Nigeria Union of Petroleum and Natural Gas Workers (NUPENG) has called for a strategic plan to reduce the heavy concentration on loading petroleum products from Apapa area. The union suggests repairing petroleum products pipelines and strategic depots across the country as well securing it from vandals. In a statement made available to The Guardian, yesterday, the General Secretary, NUPENG, Adamu Song, lamented the negligence of governments by avoiding making the infrastructural investment that holds the key to the door of the nation’s wealth and prosperity as according to him, the access roads in and out of Apapa are long overdue for expansion and reconstruction. “Since Apapa port for now serves as receiving port for more than 75 per cent of goods imported and road transportation is majorly the means of taking these goods inter land, petroleum tankers and other articulated vehicles must necessarily come to Lagos. And in same manners, these articulated vehicles must have a place to park. “Though the clearing of the trailers and trucks brought relief but has it provided us with permanent and sustainable solutions? Are we not treating the symptoms rather than the disease itself with this approach? “To avoid compounding the problems, we must collectively find a temporary parking space for these articulated vehicles because they are by necessity required to be in Lagos,” he said. He added that the second step was to propose that the designated Orile petroleum tanker parking space should be urgently given to a very competent and reputable construction company to build within a timeline of three months.